Brand identity expert David Brier inspects what makes some things great and others not so great. While David acknowledges that rules are great to follow, it’s the rule breakers who have forged innovation in business, in branding and in life. Often challenging, there’s never a dull moment when the cookie-cutter approach is discarded (and people and consumers do seek out the next terrific thing that is anything but dull). Misfits. Rebels. Innovators. Will the real one stand up? Factually, it’s sometimes impossible to tell one from the other. But you can tell them apart with this one distinction: the outcome. Did things improve? Did the changes include foresight? Did the landscape all of a sudden become bigger and more dynamic? Great brands follow the same outcomes. We believe brands are one of the great tools that, when used by intelligent minds, can help shape a company. Its destiny. Its passion. Its power. We believe every company can and should benefit from that type of empowerment and thrives best when it does. We believe owners created businesses to win and thrive, not merely limp along and survive. Companies that blend in are costly to maintain, and gravitate to themselves little, if any, brand loyalty. The ugly truth is this: consumers gravitated to “cheap brands” are loyal to the price, not to the brand. Companies should stop being clichés, me-toos and also-rans. So a company can be the leader it’s capable of being. Well, over the years during a lecture I was giving, an article I was writing or just while having a plain old heart-to-heart with a client, I’ve uttered some gems that caught me by surprise. Improv at its best. Afterwards, I repeated them as necessary in various settings and they seemed to hit the spot to shed light on a key issue a client was having. I share them here. Hopefully, you’ll find them useful too. A mind is a wonderful thing: You’re either watching reruns or you’re previewing the coming attractions. Social media isn’t a brand strategy. Social media is a channel. 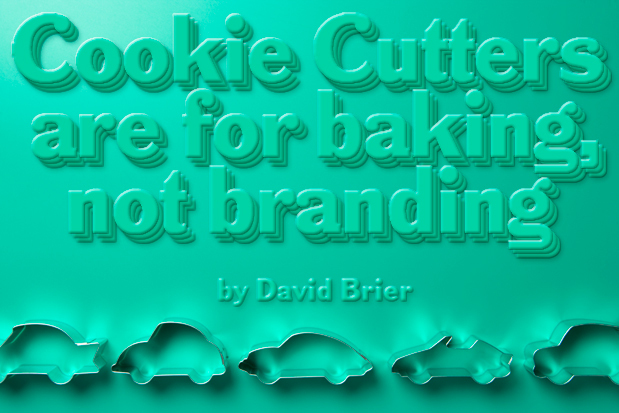 Cookie cutters are for baking, not branding. Use the above to excel, to elevate your brand and actions to a new level that makes yesterday’s “great thing” today’s fond memory. My Thank You: Since you’ve read this far, I’d like to express my appreciation with your very own a Free copy of “The Lucky Brand” eBook.